Basseterre, St. Kitts, Tuesday, 5th February, 2019, (MyVueNews.com) – The new owners of the St. Kitts & Nevis Patriots cricket franchise, have promised to invest in the development of the sport in the two island nation, now that they have taken control of what is emerging to be a relatively successful enterprise on the field of play. Since its inception as a franchise in 2015, in the Caribbean Premier League, (CPL), SKN Patriots recorded its best two years in 2017, when they reached the finals and then in 2018, when the secured a Semi-Final spot. The team has also been gaining greater popularity amongst home fans and those overseas. However, at a press conference held at the Kayanjet Lounge at the RLB International Airport on Monday, 4th February, 2019, it was announced that the franchise had been sold. The new owners were introduced as City Sports Ltd. Fans in St. Kitts and Nevis were assured during the press conference that the franchise will indeed remain in the country, and that there will be additional investment prospects that will be pursued in the country. At the conference, was also the Minister of Sport for St. Kitts and Nevis, and Deputy Prime Minister, Shawn Richards, who was assured of further commitments for the development of young crickets in the islands. 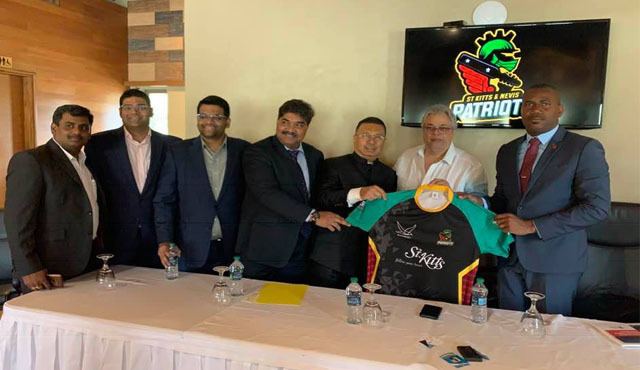 While welcoming the new owners, the Minister of Sport also expressed his appreciation to the former owner of the Patriots, “, Dr. Uday Nayak, for his foresight in bringing the Franchise to St. Kitts and Nevis and nurturing the Patriots over the last four years. This year, fans are to expect another exciting round of CPL cricket, starting at the latter part of August.